Canyon was formed by former Es-Shades drummer Richard Carmichael, who was joined by another former Es-Shade, Mark Lance (bass and vocals). Rounding out the the band were Bill Frasier on guitar and Randy Davidson on keyboards. The band played the Ohio Valley area and Columbus constantly and became a big draw in short order. The band was managed by Andy Apperson of Hilltop/Prism records and the Music Explosion. Andy had kept in touch with Kasenetz and Katz and when K&K decided to start a new label, Magna Glide, one thing lead to another and again K&K and another Ohio Valley band were aiming for the charts. 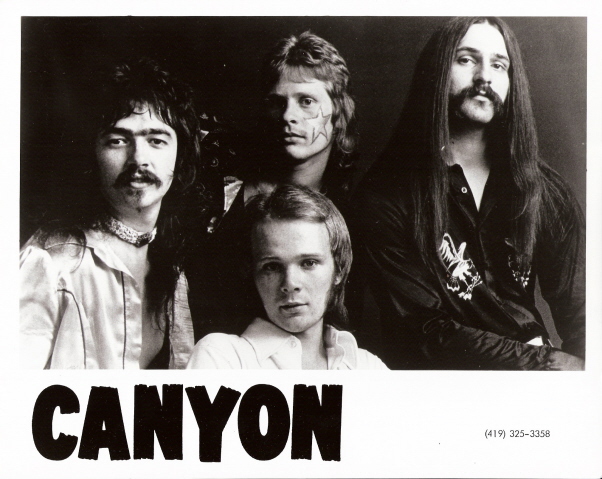 Canyon’s first 45, “Top Of The World”, was a catchy but rockin’ song written for the band by some outside writers. The record hit the Billboard charts in the summer of 1975 but could not get above #95. A few months later, Magna Glide tried again with a similar song called “Overloaded”. There does not seem to have been any commercial copies of this record pressed. All the Canyon recording sessions were done in NYC, where the band also had some pretty successful gigs.